My son and I love apple butter. I was raised eating it on toast and biscuits and I love it so much I can eat it by the spoonful. I was really surprised to find out that not everyone knows what apple butter is. Heck if I know,why is a driveway called a driveway when you just park on it? If anyone has the answers, please enlighten me. It must be a Kentucky thing, says my boyfriend! Since fall is getting ready to start and it’s apple season (not to mention my grandmother gave me 21 pounds of apples when she found out I was thinking about making apple butter) I decided to try my hand at homemade apple butter. I scoured the internet looking for interesting, but easy, recipes and found one on A Year of Slow Cooking. I cut out some of the sugar after reading about how sweet the apple butter turned out and since I’m somewhat health conscious, I figured we didn’t need all that sugar anyway. It turned out just yummy and my boyfriend has now been educated on all things apple butter! This is cooked completely in the crock pot and takes a day and a half to two days to cook. I peeled all the apples first because I didn’t want to pick out the peels after the apples cooked. Believe me, this extra step is worth it. Core and quarter the apples and place in crock pot. Add vanilla. Cover and cook on low for 8 hrs. After 8 hrs, mash the apples. I used a potato masher. At this point they are almost mush anyway so this was pretty easy. If you didn’t peel the apples now is the time to pick out all the peels. Add cinnamon, cloves and sugar and stir. Cover and cook on low for additional 6 hrs. Once the apple butter is done, blend with a stick blender (or Immersion blender, if you want to use the fancy name for it). Be careful, it is hot and it will splatter on you, speaking from experience! 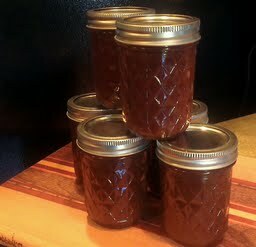 Now over the hills and through the woods to grandma’s house I go to get her to help me can all of this apple butter! This looks DELICIOUS! Do you recommend Washington apples, or is there any other type that will taste just as good? I really like apple butter and your recipe looks great, Thank you for your follow! Thanks so much! Homemade apple butter is much better than store bought!